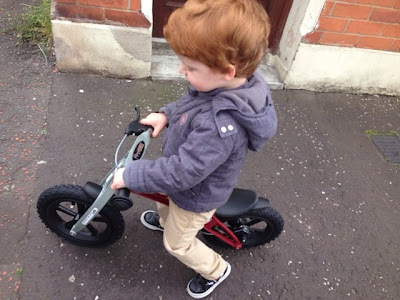 C loves being outdoors so when we were given the opportunity to review one of the bikes from the FirstBIKE range, I was delighted. I knew C would love it. FirstBIKE stock a range of balance bikes suitable for children aged 2-5 years. There are five different bikes to choose from depending on where you would be using it. Basic - This bike has non-air PU tyres so it's only suitable for nurseries with enclosed spaces or indoors. 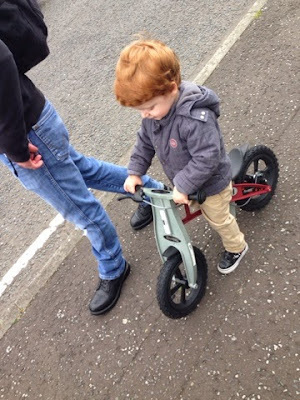 Street - This bike has air tyres which are ideal for concrete, stone or packed dirt surfaces. Cross - This one also has air tyres but these ones are suitable for off-road conditions such as grass, gravel or loose dirt. Racing - This bike has the world renowned Schwalbe Big Apple tyres which give maximum traction on any surface. Limited - This bike is similar to the Racing one, except it has limited edition colours. 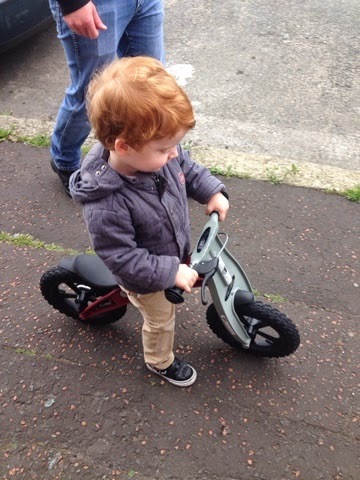 As C would be using his bike mainly on grass, I opted for the Cross bike in Red (it is also available in silver and orange). It arrived in quite a big box and it is super easy to put together. 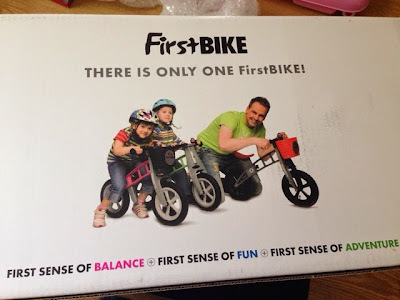 FirstBIKE have a handy video which shows you how it all fits. The Cross bike also comes with an optional lowering kit which is recommended for children aged 22 to 30 months. There is also a video on how to attach that. C is quite tall for his age (31 months) so we didn't need to use the kit. C has absolutely loved the bike. It is so sturdy and perfect for his age. 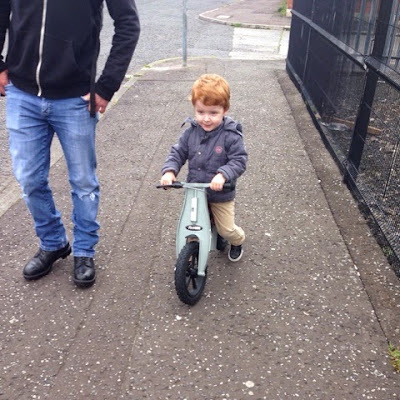 He keeps telling me that it's the "best bike ever!" I think it makes him feel like a big boy. The red and grey colours combined with the stickers make it super cool for little ones. The FirstBIKE cross only weighs 8.6lbs (and that's including the brake!) so it's not too heavy for a toddler to be pushing around. Speaking of brakes, the Cross edition comes with a child-friendly rear drum brake as opposed to the V-brake generally found on other bikes. You can easily raise and drop the seat without the use of tools which is handy if you're out and about and your child is at an uncomfortable height. The seat is in a horse saddle shape so that your child can sit comfortably without the risk of slipping off. Finally, the handlebar doesn't fully rotate. I think this is a wonderful idea as C can find it a bit difficult to steer things so this helps him keep his direction. 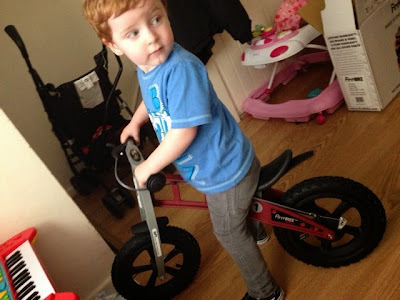 The FirstBIKE Cross retails at £94.99 and I honestly think it is one of C's favourite items at the minute. It would make the perfect present for any child. 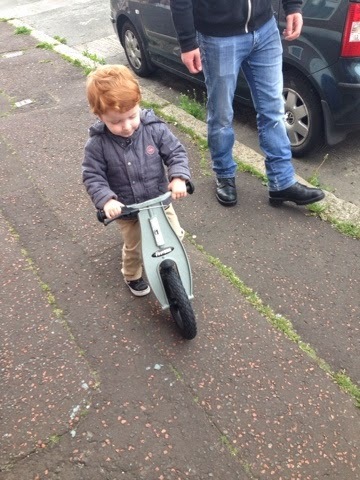 The quality is fantastic and I know he will get plenty of use out of his bike over the next few years. You can find out more at the FirstBIKE website or follow them on Facebook and Twitter. 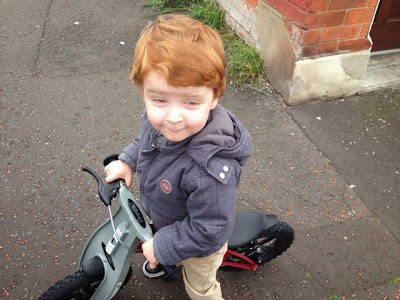 (Disclaimer: We received this bike for the purpose of this review. All thoughts and opinions are my own).